This ground-breaking work will change the way we understand religion. Period. Previous scholars such as Freud, James, Durkheim, and Maslow did not successfully identify the essence of religion as fear of death, mysticism, sacredness, communal bonding, magic, or peak experiences because religion has no single essence. Religion is about the values motivated by the sixteen basic desires of human nature. It has mass appeal because it accommodates the values of people with opposite personality traits. This is the first comprehensive theory of the psychology of religion that can be scientifically verified. Reiss proposes a peer-reviewed, original theory of mysticism, asceticism, spiritual personality, and hundreds of religious beliefs and practices. 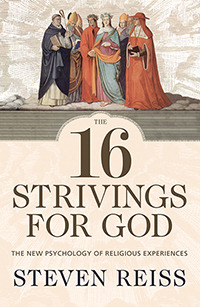 Written for serious readers and anyone interested in psychology and religion (especially their own), this eminently readable book will revolutionize the psychology of religious experience by exploring the motivations and characteristics of the individual in their religious life. Steven Reiss has developed a comprehensive theory of religion that illuminates why it is that religion is such a pervasive cultural force. Rather than impose unwarranted assumptions that either applaud or condemn religion, Reiss allows his empirically grounded theory to reveal how values that define religion are rooted in the sixteen basic desires all humans have. Steven Reiss’ response to those who see religion as stemming from the fear of death is very powerful—and a major contribution of the book in itself. Steven Reiss is a profound thinker and a deeply compassionate person. Those qualities come together in this book as he probes one of the most difficult questions of all time—what are our basic human needs and how do religion and spirituality fulfill those needs? His answers will captivate and enlighten you. Professor Reiss has written an extremely interesting, creative, and original book presenting a new theory about religion and the religious life.